Character: Brewed with native Pennsylvania neck pumpkins, and traditional pie spices with a French Saison yeast. I have had the pleasure of getting a hold of a few beers by Tröegs Independent Brewing in the past with their Troegenator Doublebock, Nugget Nectar, and Blizzard of Hops. I was thrilled to receive this beer for the site, since it’s an obvious nod to one of the most iconic classic Thrash Metal songs, “Master of Puppets” by Metallica. The label for this beer doesn’t exactly scream out Metal, but it does the beer justice by it’s simplicity. The overall color of this beer label is a salmon/orange color, which features a simple hand drawn pumpkin on it. The words Master of Pumpkins is written in a font that looks like a Metal album cover logo. All other text is written in a handwriting font. This 375 ml. bottle was corked and caged, which gave this one a nice touch. I used a Buttface Amber Ale by Humperdinks Restaurant & Brewpub shaker glass for this beer. 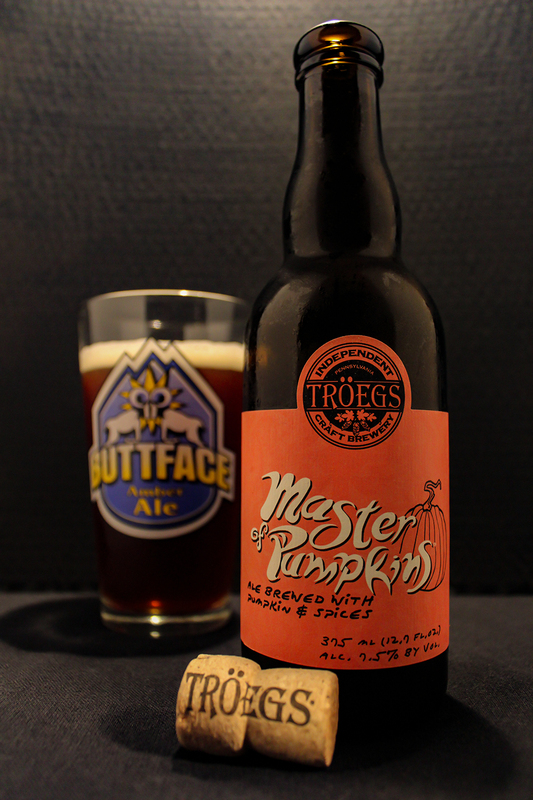 Master of Pumpkins poured a semi-hazy dark brown caramel color, similar to iced tea. On the initial pour, the beer was topped with a half inch off-white colored foamy head. The head went down to a very thin layer atop the beer. Small spots of soapy lacing left down the glass. This beer had a light and mild aroma, not very strong. The initial smell was that of squash, pumpkin, very vegetable-like. Honey, vanilla, cinnamon, nutmeg, and a little clove followed and overpowered the nose, giving this beer that normal spiced beverage that we all either love or hate towards the end of each year. The crazy thing is that the taste is so much stronger than the aroma of this beer. Right up front flavors include cinnamon, nutmeg, clove, ginger, mixed with some vanilla, and a bit of honey and whipped cream. Ends with some flavors of squash/pumpkins vegetables. Aftertaste is a mix of vanilla, honey, squash, and ginger. The body was medium. The mouthfeel was smooth, creamy and slick, with a bit of a bite from the added spices, and moderate carbonation. The finish was smooth and had a mouth coating creamy feel. This beer could easily be lost within the fields and fields of pumpkin beers. The world is over-saturated with everything pumpkin flavored. Every year, every brand in the world releases something pumpkin flavored as early as August, in some cases. The Craft Beer world is no different. Every brewery releases some form of a Pumpkin flavored beer. It really takes something special for the beer to stand out. This one had a stand out element, which I am sure is from the use of French Saison yeast. Tröegs Independent Brewing has become one of those breweries that people go crazy for, and trade for. One day, I am hoping that, without selling out to the man, this Independent brewery will become available here in Texas. Metal Connection: As this one had it’s name written all over it, and an obvious choice, I wanted to be different and use a cover version of the song this beer was named after, “Master of Puppets” that was originally recorded by Metallica back in 1986. 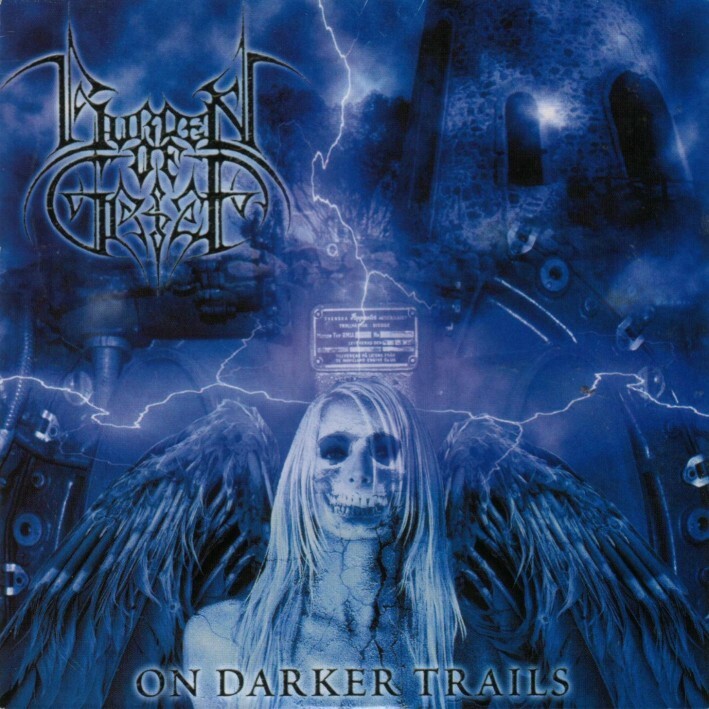 Here is a German Melodic Death Metal band by the name of Burden of Grief. On their 2001 full length album, On Darker Trails, they recorded a cover song of the classic Thrash Metal track. Following the same mind set that I had with this beer is the reason I chose this cover version. There are many, many covers of this classic song, just like there are many, many pumpkin beers. Both, the song and the beer could be lost needles within the haystack. This song can also be found on a Metallica tribute album called A Tribute to the Four Horsemen released in 2002 by Nuclear Blast Records.